You can choose to ride Loop A, which has a morning start, or Loop B, which starts in the afternoon. Or you can choose to ride both! Loop A (South Route, approx. 27 miles). Baldock, Bird Hill, Hickmans Hill, Clothall, Weston, Damask Green, Warrens Green, Halls Green, Luffenhall, Rushden, Roe Green, Sandon, Wallington and back to Baldock. Independent or unattached riders and all newcomers will be very welcome. 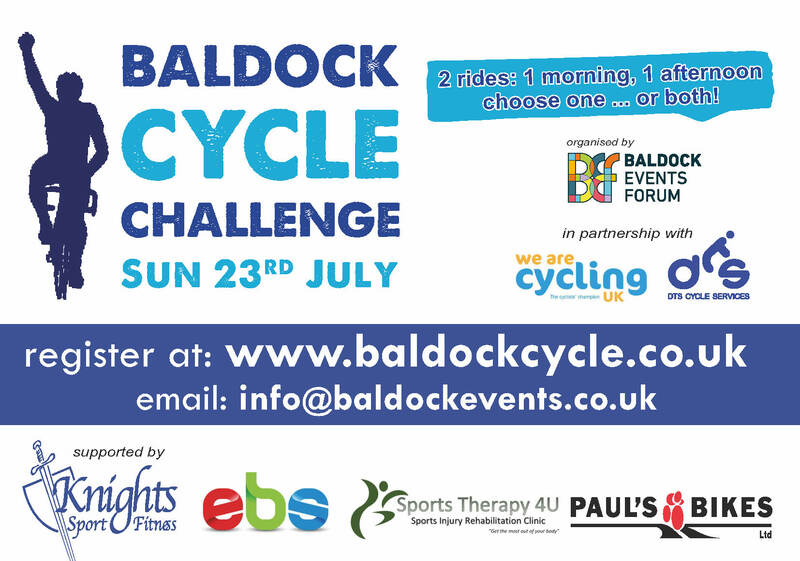 Entries can only be accepted on the day if there is sufficient space, so please enter by 21st July or you may be disappointed. Morning registration for Loop A will open at 9am, with the ride starting from 10am. There will be staggered starts, with riders let off in groups. Afternoon registration for Loop B only will open at 12 noon, with the ride starting from 1pm. Please note that Loop B must be started by 2pm and that the finish will close at 5:30pm.